Are Ex-Player Pundits Really Impartial? Are ex-player pundits impartial? Can they provide commentary without letting their bias affect what they say? Does it even matter, or is it okay that they bring their own team bias to commentary? I have a very difficult time believing that ex-players turned into commentators or pundits can be truly impartial. 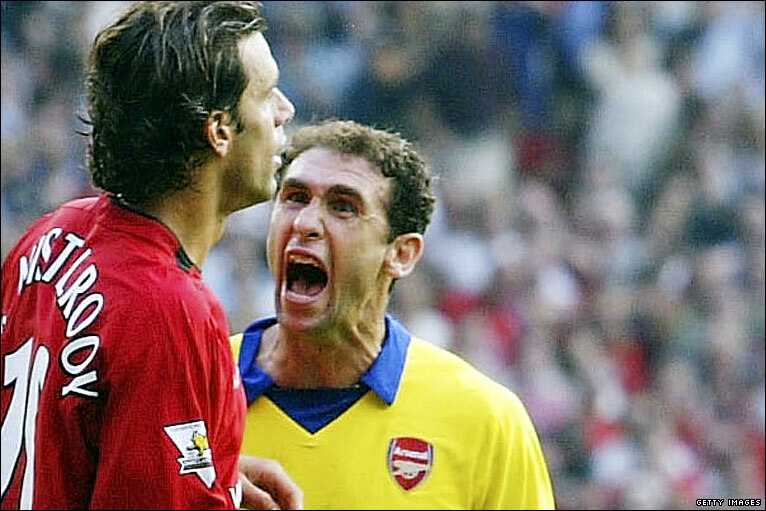 I chose the above image of Martin Keown yelling at Ruud van Nistelrooy for a number of reasons. Keown is a legend at Arsenal and is now a pundit and co-commentator for the BBC. In fact, he will be commentating for the BBC’s coverage of the FA Cup quarterfinal between Manchester United v Arsenal. I cannot imagine that he will be in any way at all unbiased or impartial in this match. He is very closely affiliated with Arsenal and, as the above image shows, he is very passionate about his support of the Gunners. At the time this picture was taken Arsenal were on their way to an unbeaten season in the Premier League. Manchester United had won a penalty and had a chance to score and possibly end that run. Before Ruud van Nistelrooy could even take the penalty Keown was already in his face and pushing him. Van Nistelrooy ended up missing the penalty and Keown completely lost it, running up and screaming in his face. To his credit van Nistelrooy ignored the neanderthal like screaming and walked away (see, even I cannot avoid some bias). Why the BBC feels that they can give the ex-Arsenal player such a high profile match to broadcast on is beyond me. He has already proven that he cannot be an impartial judge of a match in the previous FA Cup match that he commentated on between Manchester United v Cambridge United. His disappointment at United’s goals was as audible as his delight for Cambridge. As I write this I am also listening to the Talksport commentary for the FA Cup match between Aston Villa v West Bromwich Albion. Unfortunately Talksport decided to allow ex-Aston Villa forward Stan Collymore take the co-commentator position. While he may try to be impartial it still comes across rather clearly that he is a Villa supporter. Is it okay for ex-players to be such impartial pundits? Some people may think this is acceptable, but I don’t appreciate it, even if this bias is in support of my team. I should probably clarify this. There is a place for some of this team bias in pre-match or post-match punditry, but being a color commentator should include impartiality and the ability to provide input for fans of both sides. I don’t have a problem with players being commentators or pundits, but I don’t think they should be doing commentary for matches that include their team and are being broadcast nationally. I also don’t think they should be doing this for similar matches that include a rival team. This does not do any good to the listening enjoyment of fans and can become a major distraction and point of contention. This becomes especially clear if there is any controversial event that can really bring out a bias one way or the other. I often listen to baseball games and many of the games are broadcast from in-house stations that include ex-players as part of the broadcast team. For me this is a much different situation and I expect there to be some bias. In soccer the majority of matches are broadcast nationally or internationally in some way. This means that there is a much better chance that the listeners will be more split with a portion from either side. My own opinion on all of this is that ex-players should not be doing commentary for teams that they have played for or against their clubs rivals. There are far too many opportunities for the commentary to be ruined due to their bias and lack of impartiality. Home » Premier League Perspectives » Are Ex-Player Pundits Really Impartial?